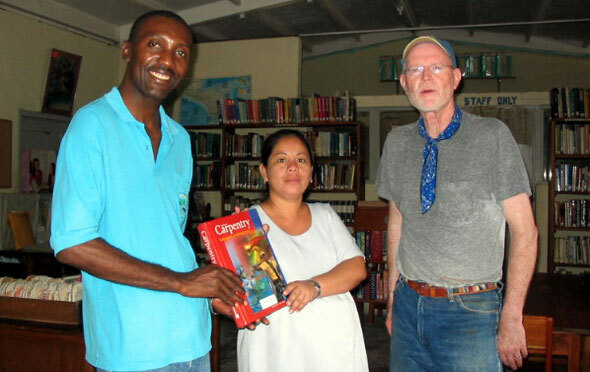 SHSU College of Education faculty member David Henderson, right, took a break from his church's construction project in Belize to take some vocational books to the Corozal town library. Elena Castanada, center, accepted the books from Henderson and Roosvelt Papouloute, pastor of the Corozal Methodist Church. Henderson and his wife discovered on their trip that simple educational tools like pencils mean a lot to Corozal students, prompting a pencil collection drive by College of Education faculty, staff and students. The College of Education at Sam Houston State University offers doctorates in educational leadership and counselor education. Students do dissertations and reports on such intricate educational issues as evaluating a school district's early reading or gifted and talented programs, or the relationship between school size and college entrance exam scores. Faculty member David Henderson, known throughout Texas for his research on public school teacher salaries, got a dose of reality recently on a trip to the poor Central American country of Belize. "For some students outside the United States, getting a better education can be as simple as having enough books and pencils," he said. Henderson and his wife, Diane, were in a group from the First United Methodist Church of Conroe who went to Belize last summer to help build a guest house/dorm for the Methodist church and school in the town of Corozal. Teams from churches in the Houston area have been going to Corozal each summer for the past 10 years. The mission group got to teach the children at the school a Bible story, read them a book and lead discussions. "My wife was teaching an art class one day and she noticed that the children were passing around pencils," Henderson said. "She asked the teacher why, and she said they simply did not have enough pencils for each student to have his or her own. Henderson told Genevieve Brown, dean of the College of Education, about his trip and the pencil shortage. As a result, the word got around to the professors, staff and students in the college, who have donated about 30 pounds of pencil--an estimated 5,000. "The response has been wonderful," Henderson said. "We're now to the point of having to decide how we're going to get all these pencils that have poured in down there." Everett Wilson, professor of biology, is planning a trip to Corozal in March, and will likely take the pencils to the town's schools, including the Corozal Catholic school, and the town library. Henderson is also contacting air carriers to see if they might like to help. Henderson also collected 125 children's books and 15 vocational textbooks at a book fair at the university. The books were donated to the Corozal library, where senior library assistant Elena Castaneda said there had not been a new vocational/technical book in 20 years. 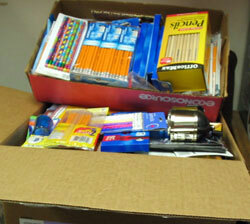 "The pencils and books are eagerly received," said Henderson, "Good old-fashioned money also helps." Donations were accepted from Bible study classes and from those who could not go but wanted to be a part of the mission experience. The money was used to buy $1,800 in supplies, to supplement the local pastor's salary, and $2,100 was given for scholarships at the Methodist school, which has kindergarten through eighth grades. The school's tuition is $30 per year plus books and a uniform of white shirt and navy pants or skirt. The Catholic school has similar needs, Henderson said. "Sometimes starting to solve educational problems can be as simple as having a modest facility and basic equipment," said Brown. "While this is not an official College of Education activity, I know that all who have participated have been happy to help in a small way."